also, watch out for stumptown coffee scheduled to open soon at the new ace hotel! did i miss out on any other spots? i would love to know! when we first arrived to new orleans last october, i was on the look out for a good coffee shop in our neighbourhood. one of my favorite routines is going out in the morning with julia and grabbing a coffee, to help start my days off on the right foot :) it’s amazing how kids like their routines, so it works out for both of us. luckily, on day 2 i found district hand pie & coffee bar, just two blocks away from our airbnb. not only the girls there are super friendly, but their coffee is really good, and they use the best ingredients. on special ‘treat days’, which happened more often than i would like to admit, we would get a blueberry muffin or a chocolate chip cookie with sea salt – delicious and just too tempting! then we found out they also have a food truck (which we never got the chance to see) and a second location on magazine street, district: donuts, sliders, brew – a fun and casual spot for craft brewed coffee, sliders and an outstanding creativity for donut flavors. their mind-blowing donuts are different every day and range from salted caramel, vietnamese iced coffee, red beans and rice, peanut butter and marshmallow or limoncello and poppyseed to name a few. its always busy and sometimes with a queue that can scare you off, but so worth the wait. also, how cool are those iconic benches pictured on top?! district is definitely our favorite coffee shop in new orleans, there’s nothing like it and we”re going to miss our daily coffees and weekend donut dates! during our last weeks in new orleans we tried to soak up as much time as we could around town, that meant juggling ‘julia time’ with ‘me time’ :) and it meant fitting in a little bit of local shopping too! so on our way to some exploring we made a pit stop at krewe du optic – a new orleans based eyewear company that i found about through instagram. amongst quaint streets and colorful verandas the store has a real clean look, with a little coffee shop by merchant and a back yard, it almost felt like a little oasis in the heart of the french quarter. needless to say i loved most of them, so hard to chose!! i’m usually indecisive, and in regards to eyewear almost always go for brown frames – but hannah was super friendly and helpful in picking out a new pair of sunnies that would be original and different yet still a little traditional – like the ones julia’s wearing below? if you’re visiting new orleans, you must make a pit stop at krewe du optic, head over here to see their contact details. ps – more new orleans favorites of mine. one of the reasons james was excited about moving to new orleans, was the variety of vietnamese food available, he craves it all the time and, if possible, would eat it every day. he also likes hole in the wall type of restaurants, but to be honest that’s just not my thing (let’s keep it real, folks!). so when we found magasin cafe, a modern vietnamese restaurant, located just a few blocks from our house, we hit jackpot finding a good compromise for both. when i like a certain dish, i find it difficult to be adventurous, so i always order the same thing – vermicelli (rice noodles with lettuce, cabbage, mint, bean sprouts and peanuts) with grilled pork or sometimes grilled shrimp – filling, yet light and delicious. also, they’ve just recently opened magasin kitchen, their new restaurant in new orlean’s central business district. i haven’t had the chance to try, but it looks pretty cool too. in our neighbourhood, uptown new orleans, most houses have subtle colours like grey, beige and mauve (like this one). but as you drive east, towards the marigny and bywater area, you can see a lot of caribbean influences, the houses burst in colour (like these ones), and i’m totally obsessed with these combinations. 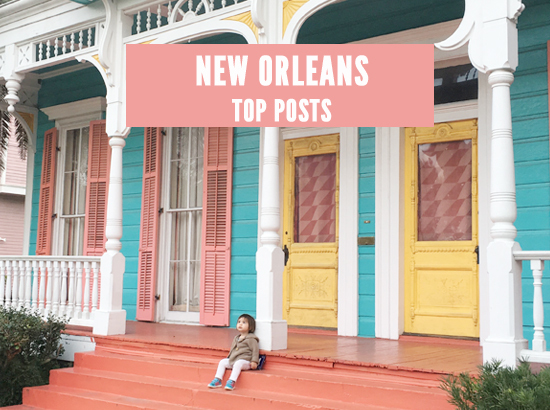 ps – 5 things i’m loving about new orleans from our first month in the city, and other new orleans posts here.